Over the last couple years I have really gotten into make up. To be honest, I use to shop only designer when it came to make up. 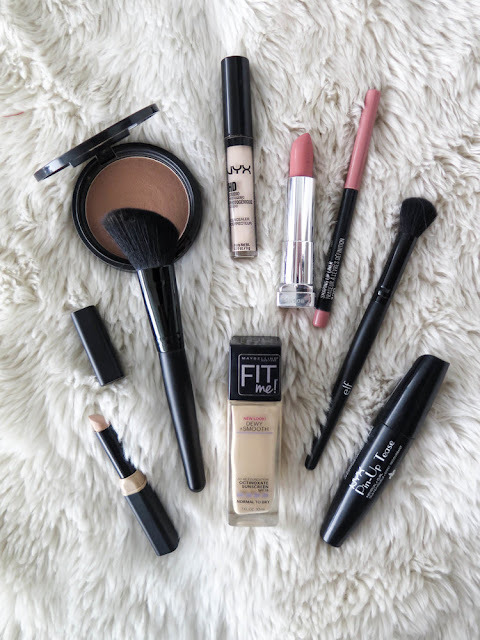 But as I began to explore more into the world of beauty I noticed there were many drug store brands that were just as good if not better than the designer brands (in my opinion). Don't get me wrong, I have a big make up collection and am constantly switching things up so there may be moments I'm really into one thing and something new the next month. 1. Maybelline Fit Me / Dewy + Smooth: foundation was the one thing I wouldn't mind spending a lot of money on, after all, it's the base of your make up. I always wanted to make sure I wasn't caking on a product that would make me break out or wouldn't do the job covering the problem areas. At the moment my skin is pretty clear, with the occasional break out, so I'm not looking for a heavy duty foundation. Fit Me, covers, with out being thick, or looking cakey and it has a nice dewy finish which I love. If you need more coverage, apply a layer, let dry and apply another layer. This stuff easily compares to expensive foundations and at a price point of $7.99 it's a product I will certainly be sticking to for a while. 5. E.L.F cosmetics brushes: These make up brushes are so good and at such a low price point, there's nothing that beats them. They compare to high end brushes but also outshine the rest of the drug store brands. I've tried several drug store brushes and have found them to be, flimsy, scratchy, face-tearing, just over all bad products. These brushes are complete opposite of that. There's a brush for just about anything, I love the angled blush brush which I use to apply my bronzer and also the concealer brush which I use to apply a powder high lighter. There are a ton of their brushes that I really like but the focus of this post is what I use day to day for a basic look. The best part about these brushes has to be the price, the angled brush costs $4.00 while the concealer brush is $3.00 - That beats spending $30 per brush! !